of the Holy Spirit and the Virgin Mary and became human. and dead and His kingdom shall have no end. The Nicene Creed is a Statement of faith expressing the fundamental beliefs of the Christian Church. In English, the word creed comes from Latin ( credo ) and means I believe (in Greek Πιστεýω). A Christian Creed is an expression of fundamental beliefs, beliefs that go to the heart of what defines a Christian. 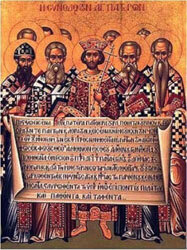 The Nicene Creed takes its name from the First Ecumenical Council that was held in the ancient city of Nicaea in 325 AD. The council was called by the Roman Emperor of the time, Constantine. The clergy gathered for the Council, addressed themselves to a great controversy of the time — Arianism; it was the priest Arius and his followers whose heresy denied the eternal divinity of the Son of God — incarnate in the flesh and born of a woman . A further Council — The Second Ecumenical Council held at Constantinople in 381 AD was called to address other heresies that had arisen against the orthodox teaching of the Church. In particular, the Council stood against a denial by some members of the church regarding the true divinity of the Holy Spirit. It was this Council that expanded the Creed with particular reference to the Holy Spirit who proceeds from the Father and who together with the Father and Son is worshipped and glorified . The Nicene Creed cannot be said to contain within it detail of all the doctrines of the Church. However, it is a summary of basic beliefs that were under attack from heresies arising in the early Church. By reciting the Creed and using it as a yardstick or a rule , it becomes both a statement of Orthodox faith and also a means of identifying fundamental false beliefs. In its original form the Creed was in the plural — We believe . In this form, it expresses the common belief of the whole Church. In the services of the Orthodox Church, the Creed is recited in the singular — I believe , expressing the orthodoxy of the beliefs of the individual Christian and his or her adherence to the Holy Tradition that has been handed down by Christ to his Apostles and from them to those gathered in the Councils of the Church so long ago. It is this same Holy Tradition that has been handed on unchanged to the present day. The Creed has a prominent place in many of the services of the Orthodox Church. 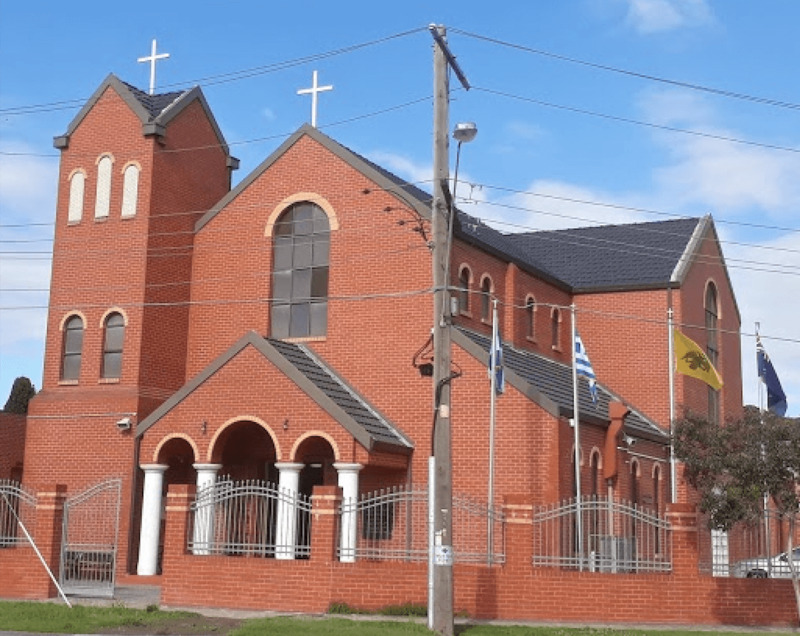 It is recited in the main service of our Church, the Divine Liturgy and, importantly, is recited by the catechumen (the candidate for Baptism), or by the Godparent before the Baptism takes place. To say the words of the Creed is to show that you hold true to the doctrines for which so many throughout the history of the Church have fought and often died to protect. To state I believe … is to express your determination to stand against heresies of false belief that continue to attack the Church down to the present time. The Resurrection of all people and eternal life. The Church formulated the Creed to express true belief in God in the face of false beliefs , and yet it has been this very Creed that has become a point of disagreement and a reason for division of some from that same Church that first expressed it. It was the Third Ecumenical Council (in the city of Ephesus in 431 AD) that reaffirmed the words of the Creed and expressed them as forever unchanging and unchangeable . It was only a few years after this very Council of 431 AD, that some in the western Church began to insert an extra word into the Creed. In the Latin version of the Creed, the word filioque ( and from the Son ) was added in the statement concerning the nature of the Holy Spirit. This small word had large consequences; it became the cause of much theological disagreement and was a major factor in the eventual separation of the Roman Church from the Orthodox in 1054 AD. To say the Holy Spirit proceeds from the Father and the Son , is to attempt to change the very nature of God as he has revealed himself — the Orthodox belief that God is three persons and yet one God . The addition of the filioque is to confuse and turn upside down this revelation. This is not just an argument about words, of semantics; it comes to the very heart of who God is. It is this fundamental Christian truth that the Creed was promulgated to protect! To this day, the Orthodox Church stands firm on the use of the Creed in its original form as declared at the first three Ecumenical Councils of the undivided Church. It is interesting that some Protestant Churches have, in more recent times, expressed the Creed in its original form (without the filioque) as an alternative or preferred form. The debate still rages between the Roman and Orthodox Churches concerning the filioque . It was this inclusion into the Creed that had so much bearing upon the eventual separation of the Roman Church 1054 AD, and, sadly, it is its continual use that proves to be such a major obstacle in any talks of reunion.